The FLIR ThermoSight® RS-Series is an essential tool for hunting predators and nuisance species in zero light. Featuring advanced image correction technology and a smooth frame rate of 30 Hz, the RS-Series offers long range targeting with several different fixed lens options. 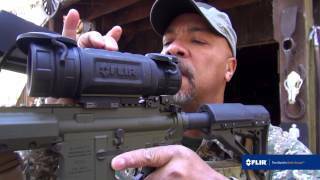 The RS-Series provides three inches of eye relief, up to an 16× digital zoom, and multiple reticle options with a repeatable and dependable zero, as well as video out. The ThermoSight® RS-Series reveals the body heat of target animals, while you remain hidden in darkness. With glove-friendly buttons and an intuitive menu, you can quickly set reticle settings, zoom, and polarity palettes in three clicks or less. The scope's advanced technology optimizes images automatically, while offering multiple reticle options with a repeatable and dependable zero.